In today’s episode I’ll wrap up a series of interviews recorded last week as I talk to Juli Crockett from IO West, actor Lindsay Sloane and writers Eric Weinberg and Richard Mueller from the picket line in front of Fox Studios. Recorded Monday, 28 January 2008. 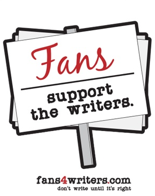 Tonight: The Armando WGA/SAG Solidarity Shows event will culminate in a star-studded strike support show, with 100% of the box office going to the Writers Guild Foundation Industry Support Fund. Kate Walsh (Private Practice, Gray's Anatomy) and Reno 911 creator and star Robert Ben Garant have been confirmed to host the 3-act, 2 ½ hour improv extravaganza. Robert Garant (along with partner Thomas Lennon) is a top screenwriter, having written the hits The Pacifier, Herbie: Fully Loaded, Balls of Fury, Night at the Museum, and the upcoming Night at the Museum 2. The Office’s Angela Kinsey, Kate Flannery, and Ed Helms as well as MADtv’s Mo Collins will be joining the cast of regular “Armando” performers including Tim Meadows (Walk Hard, SNL) and MADtv’s Stephnie Weir among other notable iO alums for this incredible night. Having declared January WGA Strike Support Month at the iO WEST in Hollywood and donating 50% of the box office from select shows to the Writers Guild Foundation Industry Support Fund in a demonstration of solidarity and support for the striking writers, the iO WEST is continuing the support into February as the writer’s strike drags on. Every night, until the strike is over, iO WEST will be offering $3 well drinks and $2 PBR for WGA members who present their membership cards. February 4th. 9 PM. Mainstage. $25.